Though there were about 50 members of the Congress at a given time, it was the states that had votes, so there were effectively only 13 seats. The Second Continental Congress was a convention of delegates from the Thirteen Colonies that started meeting in the summer of 1775, in Philadelphia, Pennsylvania, soon after warfare, the American Revolutionary War had begun. It succeeded the First Continental Congress, which met between September 5, 1774 and October 26, 1774, also in Philadelphia. The second Congress managed the colonial war effort, and moved incrementally towards independence, adopting the United States Declaration of Independence on July 4, 1776. By raising armies, directing strategy, appointing diplomats, and making formal treaties such as the Olive Branch Petition, the Congress acted as the de facto national government of what became the United States. When the Second Continental Congress came together on May 10, 1775 it was, in effect, a reconvening of the First Continental Congress. Many of the same 56 delegates who attended the first meeting were in attendance at the second, and the delegates appointed the same president (Peyton Randolph) and secretary (Charles Thomson). Notable new arrivals included Benjamin Franklin of Pennsylvania and John Hancock of Massachusetts. Within two weeks, Randolph was summoned back to Virginia to preside over the House of Burgesses; he was replaced in the Virginia delegation by Thomas Jefferson, who arrived several weeks later. Henry Middleton was elected as president to replace Randolph, but he declined. Hancock was elected president on May 24. Provincial Congress to decide how to respond to the American Revolution, and that congress decided on July 8 to send delegates to the Continental Congress. They arrived on July 20. Its predecessor, the First Continental Congress, had sent entreaties to the British Coercive Acts and had created the Continental Association to establish a coordinated protest of the Coercive Acts; in particular, a boycott had been placed on British goods. That First Congress provided that the Second Continental Congress would meet on May 10, 1775, to plan further responses if the British government had not repealed or modified the Coercive Acts. Henderson, H. James (2002) . 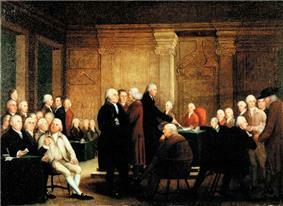 Party Politics in the Continental Congress. Rowman & Littlefield. Montross, Lynn (1970) . 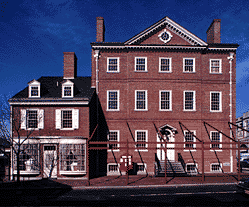 The Reluctant Rebels; the Story of the Continental Congress, 1774–1789. Barnes & Noble. Fowler, William M., Jr. (1980). The Baron of Beacon Hill: A Biography of John Hancock. Boston: Houghton Mifflin. ^ Cogliano, Revolutionary America, 1763-1815, 113. ^ Worthington C. Ford, et al. (ed. ), ed. (1904–1939). Journals of the Continental Congress, 1774–1789. ^ Staib, Walter. City Tavern Cookbook: 200 Years of Classic Recipes from America's First Gourmet Restaurant, pp. 5, 11-15, Running Press, Philadelphia, London, 1999. ISBN 0-7624-0529-5. ^ Staib, Walter. City Tavern Baking & Dessert Cookbook: 200 Years of Authentic American Recipes from Martha Washington's Chocolate Mousse Cake to Thomas Jefferson's Sweet Potato Biscuits, pp. 8-10, 14-15, Running Press, Philadelphia, London, 2003. ISBN 0-7624-1554-1. ^ Burnett, Continental Congress, 503. Finally, on March 1, 1781, the Articles of Confederation were signed by delegates of Maryland at a meeting of the Second Continental Congress, which then declared the Articles ratified. On the next day, the same congressional delegates met as the new  The congress still called itself the Continental Congress. It would be the Confederation Congress that would oversee the conclusion of the American Revolution. After more than a year of debate, on November 15, 1777, Congress passed and sent to the states for ratification the Articles of Confederation. The issue was large states wanting a larger say, nullified by small states who feared tyranny. Jefferson's proposal for a Senate to represent the states and a House to represent the people was rejected (a similar proposal was adopted later in the United States Constitution). The small states won and each state had one vote. Congress urged the individual states to pass the Articles as quickly as possible, but it took three and a half years for all the states to ratify the Articles. Of the then thirteen states, the State Legislature of Virginia was the first to ratify the Articles, on December 16, 1777, and the State Legislature of Maryland became the last to do so, on February 2, 1781. In the meantime, the Second Continental Congress tried to lead the new country through the war with borrowed money and no taxing power. The Congress moved from Philadelphia to Baltimore in the winter of 1776 to avoid capture by British forces, who were advancing on Philadelphia. As the largest building in then forty-seven-year-old Baltimore Town, Henry Fite's tavern provided a comfortable location of sufficient size for Congress to meet; its site at the western edge of town was beyond easy reach of the British Royal Navy's ships should they try to sail up the Harbor and the Patapsco River to shell the town. The Continental Congress was again forced to flee Philadelphia at the end of September 1777, as British troops occupied the city. 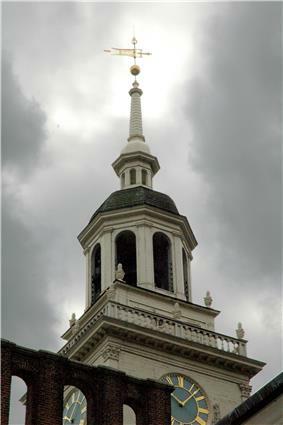 The Congress moved to York, Pennsylvania, and continued their work. 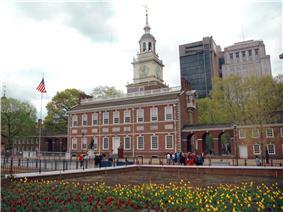 Congress finally approved the resolution of independence on July 2, 1776. Congress next turned its attention to a formal explanation of this decision, the United States Declaration of Independence, which was approved on July 4 and published soon thereafter. The records of the Continental Congress confirm that the need for a declaration of independence was intimately linked with the demands of international relations. On June 7, 1776, Richard Henry Lee offered a resolution before the Continental Congress declaring the colonies independent. He also urged Congress to resolve "to take the most effectual measures for forming foreign Alliances" and to prepare a plan of confederation for the newly independent states. Lee argued that independence was the only way to ensure a foreign alliance, since no European monarchs would deal with America if they remained Britain's colonies. American leaders had rejected the divine right of kings in the New World, but recognized the necessity of proving their credibility in the Old World. Congress would formally adopt the resolution of independence, but only after creating three overlapping committees to draft the Declaration, a Model Treaty, and the Articles of Confederation. The Declaration announced the states' entry into the international system; the model treaty was designed to establish amity and commerce with other states; and the Articles of Confederation, which established "a firm league" among the thirteen free and independent states; together these constituted an international agreement to set up central institutions for the conduct of vital domestic and foreign affairs. 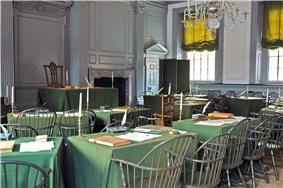 The Assembly Room in Philadelphia's Independence Hall, where the Second Continental Congress adopted the Declaration of Independence. Congress was moving towards declaring independence from the British Empire in 1776, but many delegates lacked the authority from their home governments to take such a drastic action. Advocates of independence in Congress moved to have reluctant colonial governments revise instructions to their delegations, or even replace those governments which would not authorize independence. On May 10, 1776, Congress passed a resolution recommending that any colony lacking a proper (i.e. a revolutionary) government should form such. On May 15 Congress adopted a more radical preamble to this resolution, drafted by John Adams, in which it advised throwing off oaths of allegiance and suppressing the authority of the Crown in any colonial government that still derived its authority from the Crown. That same day the Virginia Convention instructed its delegation in Philadelphia to propose a resolution that called for a declaration of independence, the formation of foreign alliances, and a confederation of the states. The resolution of independence was delayed for several weeks as revolutionaries consolidated support for independence in their home governments. The appointment of the delegates to both these congresses was generally by popular conventions, though in some instances by state assemblies. But in neither case can the appointing body be considered the original depository of the power by which the delegates acted; for the conventions were either self-appointed "committees of safety" or hastily assembled popular gatherings, including but a small fraction of the population to be represented, and the state assemblies had no right to surrender to another body one atom of the power which had been granted to them, or to create a new power which should govern the people without their will. The source of the powers of congress is to be sought solely in the acquiescence of the people, without which every congressional resolution, with or without the benediction of popular conventions or state legislatures, would have been a mere brutum fulmen; and, as the congress unquestionably exercised national powers, operating over the whole country, the conclusion is inevitable that the will of the whole people is the source of national government in the United States, even from its first imperfect appearance in the second continental congress.